A previous study has shown that moving 3D data visualizations to the physical world can improve users' efficiency at information retrieval tasks. Here, we re-analyze a subset of the experimental data using a multiverse analysis approach. Results from this multiverse analysis are presented as explorable explanations, and can be interactively explored in this paper. The study's findings appear to be robust to choices in statistical analysis. Human Factors; Design; Experimentation; Measurement. Whereas traditional visualizations map data to pixels or ink, physical visualizations (or "data physicalizations") map data to physical form. While physical visualizations are compelling as an art form, it is unclear whether they can help users carry out actual information visualization tasks. Five years ago, a study was published comparing physical to on-screen visualizations in their ability to support basic information retrieval tasks . Interactive 2D representations were clearly the fastest, but a gain in speed was observed when transitioning from on-screen to physical 3D representations. Overall, the study suggested that features unique to physical objects – such as their ability to be directly touched – can facilitate information retrieval. These results however only hold for the particular data analysis that was conducted. A group of statisticians and methodologists recently argued that results from a single analysis can be unreliable . They recommended researchers to conduct instead multiverse analyses, i.e., to perform all reasonable analyses of their data and report a summary of their outcomes. While Steegen et al. show how to summarize all outcomes using p-values, here we use an interactive approach based on Bret Victor's concept of explorable explanation . 3D bar chart, on-screen and physical. The study consisted of two experiments. In the first experiment, participants were presented with 3D bar charts showing country indicator data, and were asked simple questions about the data. 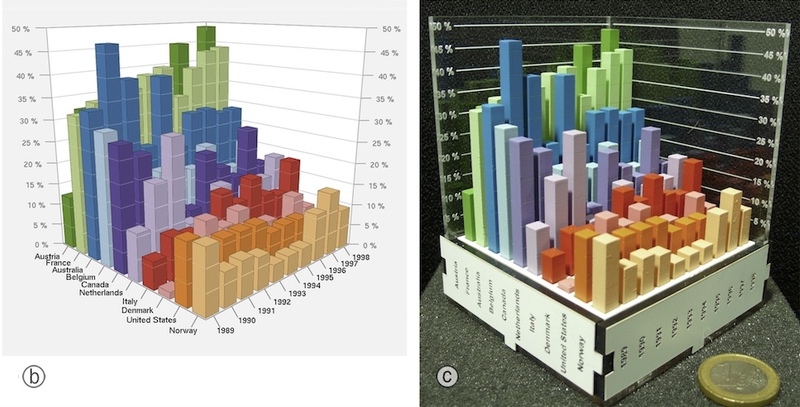 The 3D bar charts were presented both on a screen and in physical form (see Figure 1). The on-screen bar chart could be rotated in all directions with the mouse. Both a regular and a stereoscopic display were tested. An interactive 2D bar chart was also used as a control condition. Accuracy was high across all conditions, but average completion time was lower with physical 3D bar charts than with on-screen 3D bar charts. physical touch: physical 3D bar charts where touch was explicitly encouraged in the instructions. physical no touch: same charts as above except subjects were told not to use their fingers to mark points of interest (labels and bars). virtual prop: on-screen 3D bar charts with a tangible prop for controlling 3D rotation. virtual mouse: same charts as above, but 3D rotation was mouse-controlled. These manipulations were meant to answer three questions: 1) how important is direct touch in the physical condition? 2) how important is rotation by direct manipulation? 3) how important is visual realism? Visual realism referred to the higher perceptual richness of physical objects compared to on-screen objects, especially concerning depth cues. Figure 2 summarizes the three effects of interest. Sixteen participants were recruited, all of whom saw the four conditions in counterbalanced order. For more details about the experiment, please refer to . Like the original paper we use an estimation approach, meaning that we report and interpret all results based on (unstandardized) effect sizes and their interval estimates . We explain how to translate the results into statistical significance language to provide a point of reference, but we warn the reader against the pitfalls of dichotomous interpretations . Average task completion time (arithmetic mean) (geometric mean) for each condition. Error bars are t-based BCa bootstrap CIs. We focus our analysis on task completion times, reported in Figures 3 and 4. Dots indicate sample means, while error bars are confidence intervals computed on untransformed data log-transformed data using the t-distribution BCa bootstrap method. Strictly speaking, all we can assert about each interval is that it comes from a procedure designed to capture the population mean of the time across replications, under some assumptions . In practice, if we assume we have very little prior knowledge about population means, each interval can be informally interpreted as a range of plausible values for the population mean, with the midpoint being about 7 times more likely than the endpoints . Figure 3 shows the mean (geometric) mean completion time for each condition. At first sight, physical touch appears to be faster than the other conditions. However, since condition is a within-subject factor, it is preferable to examine within-subject differences , shown in Figure 4. Figure 4 shows the pairwise differences ratios between mean completion times. A value lower than 0 1 (i.e., on the left side of the dark line) means the condition on the left is faster than the condition on the right. The confidence intervals are not corrected for multiplicity. Bonferroni-corrected Since the individual confidence level is , meaning they are effectively CIs . Thus, an interval that does not contain the value 0 the value 1 incidates a statistically significant difference at the α= level. The probability of getting at least one such interval if all population means were zero (i.e., the familywise error rate) is α=. Likewise, the simultaneous confidence level is , meaning that if we replicate our experiment over and over, we should expect the confidence intervals to capture all population means of the time. Differences between mean completion times (arithmetic means) Ratios between average task completion times (geometric means) between conditions. Error bars are Bonferroni-corrected t-based BCa bootstrap CIs. Figure 4 provides good evidence that i) physical touch is faster on average than physical no touch, and that ii) physical no touch is faster than virtual prop. This suggests that both visual realism (e.g., rich depth cues) and physical touch can facilitate basic information retrieval. Importantly, these two properties are unique to physical objects and are hard to faithfully reproduce in virtual setups. In contrast, we could not find evidence that physical object rotation (as opposed to mouse-operated rotation) provides a performance advantage for information retrieval. Our findings for experiment 2 are in line with the previously published study . In the present article, the default analysis options reflect the choices made in the previously published analysis – thus, the figures are by default identical. On top of this, we consider alternative choices in statistical analysis and presentation, which together yield a total 56 unique analyses and results. The conclusions are largely robust to these choices. Results are less clean with untransformed data, likely because abnormally high completion times are given as much weight as other observations. The use of a log transformation addresses this issue without the need for outlier removal . Meanwhile, the use of bootstrap CIs makes the results slightly stronger, although this is likely because bootstrap CIs are slightly too liberal for small sample sizes . We did not re-analyze experiment 1 to keep this article simple. Since experiment 1 used four conditions and the reported analysis included a figure with seven comparisons , it is possible that some of the effects become much less conclusive after correcting for multiplicity. Multiplicity correction is however a contested practice , thus it is generally best to consider both corrected and uncorrected interval estimates. The goal of this article was to illustrate how the ideas of multiverse analysis and of explorable explanation can be combined to produce more transparent and more compelling statistical reports. We only provided a few analysis options, and many more options could have been included. In addition, our choice of analysis options was highly personal and subjective. Steegen et al. have argued that multiverse analyses are necessarily incomplete and subjective, but are nonetheless way more transparent than conventional analyses where no information is provided about the robustness or fragility of researchers' findings .